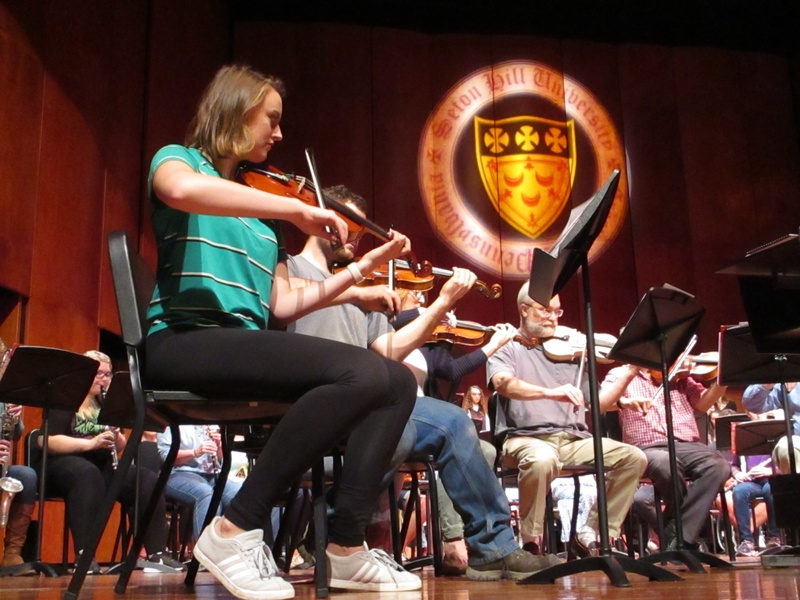 Members of the Sinfonia at Seton Hill perform during rehearsal on Friday, Sept. 28 for the centennial concert at SHU. The concert will be held on Sunday, Sept. 30 at 2 p.m. at the SHU Performing Arts Center. Photo by P.Parise/Setonian. Seton Hill University is celebrating 100 years of music with its centennial concert on Sunday, Sept. 30. “Connecting the Generations” will begin at 2 p.m. in the Carol Reichgut Concert Hall in the SHU Performing Arts Center. The concert will feature performances by the Westmoreland Symphonic Winds, Setonia (women’s chorale), Sinfonia at Seton Hill, Una Voce Chamber Choir, Faculty Jazz Combo and Commercial Music Ensemble, along with a cello solo by community music instructor Sarah Ferrell. The concert also honors the Sisters of Charity of Seton Hill for being “livelong supporters of the arts,” according to Campbell. To do this, the concert features music that was composed and arranged by the Sisters of Charity, previous SHU students and current SHU students and faculty. “We’re delighted that there will be a number of Sisters of Charity who will attend the event, and in a public way, be able to thank them for all that they have done for us,” Campbell said. Tickets are $10 for general admission and $5 for SHU students. Proceeds will go toward the Centennial Campaign for Student Scholarships, which supports music students.